Dropbox is a popular file hosting service that offers cloud storage, file synchronization, personal cloud, and client software. Most importantly, Dropbox has become the dominant and de-facto file synchronization and backup cloud storage space service provider for most online, offline, desktop or mobile apps and services. Thanks to Dropbox robust API, most if not all of the apps or services that require transferring of files have Dropbox support built-in, making it even more essential to have enough and large disk storage space in Dropbox, especially the permanently free space that lasts forever. When you sign up for Dropbox, you’re given a paltry 2 GB of free space automatically. Considering even the Apple is providing a more generous 5 GB free space for iCloud users who are known as willing to pay hefty price for any products from Apple, the 2 GB free space offered by Dropbox is just ‘mean’. Luckily, Dropbox provides various ways for users to increase free space allocated to their Dropbox account, which can potentially add up to a total of 23 GB, a generous free storage space that exceeds 15 GB offered by Google Drive and Microsoft OneDrive. 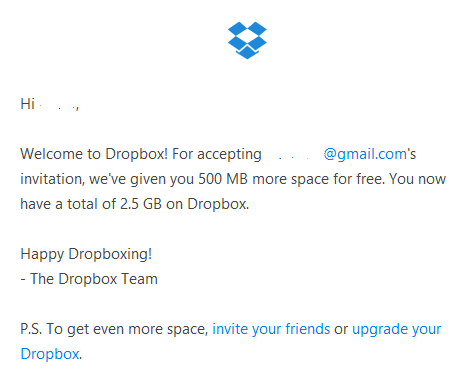 Yes, your friend who invited you does earn 500 MB of free space to his or her account, but Dropbox does reward you with free 500 MB space too. You earn referral sign up bonus space, you need to install Dropbox desktop application and link it to email used to register for Dropbox account. Invite some friends to join Dropbox (you just need to type in any email to send an invite to complete this task). Install Dropbox on your mobile device. Free 125 MB when you connect Dropbox to your Facebook account. Visit https://www.dropbox.com/getspace and click Connect your Facebook account to start. Free 125 MB when you connect Dropbox to your Twitter account. Visit https://www.dropbox.com/getspace and click Connect your Twitter account to start. Free 125 MB when you follow @Dropbox on Twitter. Visit https://www.dropbox.com/getspace and click Follow Dropbox on Twitter to start. Free 125 MB when you praise Dropbox or give them any feedback by telling Dropbox why you love Dropbox. Visit https://www.dropbox.com/getspace and click Tell us why you love Dropbox to start. 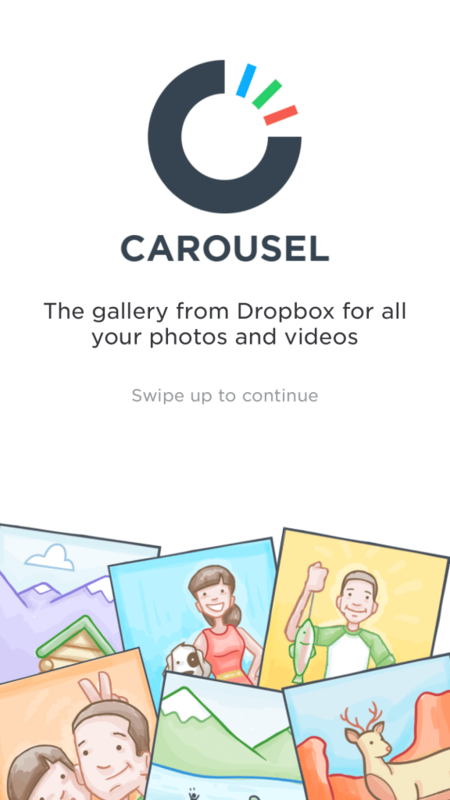 Get 3 GB of bonus space when you start using Carousel, the gallery app from Dropbox for all your photos and videos. To earn the free 3 GB space, download and install the app on your iOS or Android device. 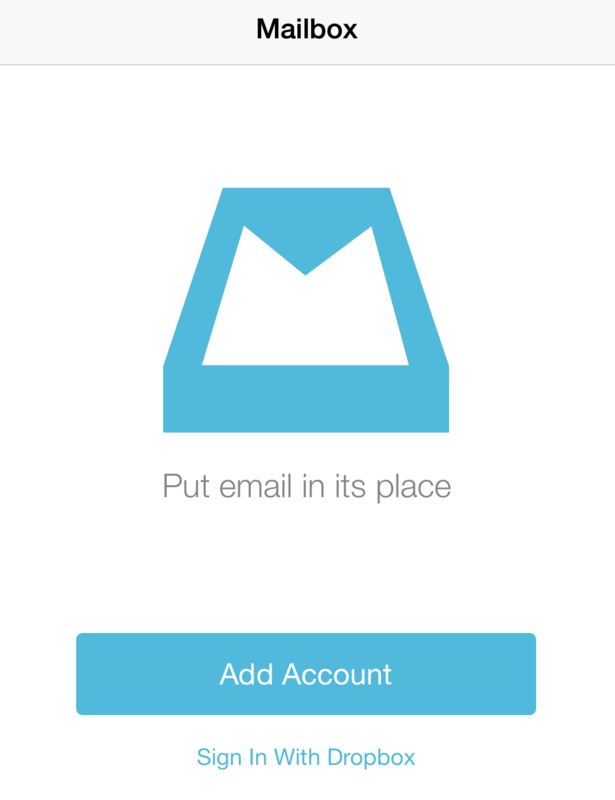 Get 1 GB of bonus space when you start using Mailbox, a completely redesigned inbox that makes email light, fast, and mobile-friendly. To earn the free 1 GB space, download and install the app on your iOS or Android device. Sign into the app with your Dropbox account, and the bonus space will appear instantly in your Dropbox account. You can delete the app after getting the free bonus space which is added to your account forever. 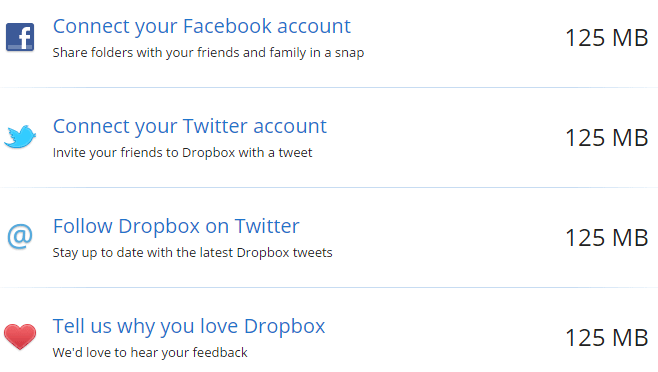 Referral is where the bulk of free Dropbox space will be earned, but it’s also the harder. Dropbox adds 500 MB additional free space to your account permanently when someone you invited signed up for Dropbox using your referral link, installed then logged into the Dropbox desktop app. 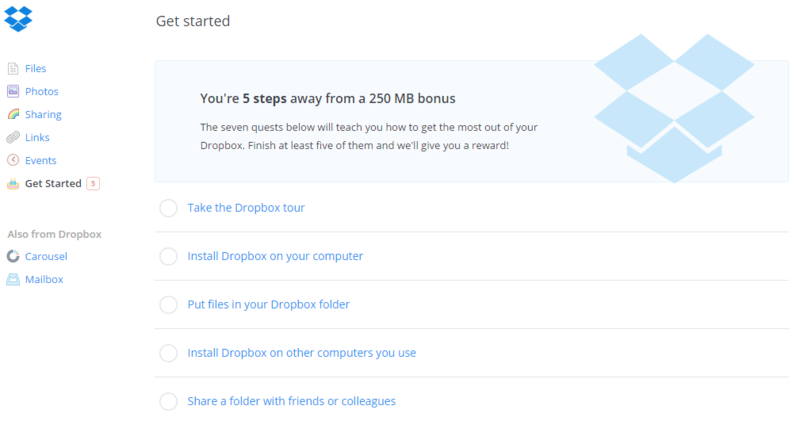 Dropbox allows each Dropbox Basic (free account) user to refer up to 32 people for total of 16 GB free bonus space. Due to popularity of Dropbox, chance is that many of your friends already have Dropbox account. If so, you have to resort to tricks to get referrals. For example, you can advertise your referral link through Google AdWords, or you can use ‘fake emails’ to sign up and login into Dropbox desktop client ‘on behalf of fake users’ yourself. That’s it. Enjoy your Dropbox account which the free space has increased tenfold permanently. Of course, there are some other ways to earn free space on Dropbox, such as mobile promotion by Samsung and HTC. But these promotions only give you the extra storage space, e.g. 23 GB or 48 GB, for a limited period of time, e.g. 2 years or 6 months. As such they’re not included as a way to get extra free space on Dropbox.